In light of trying to figure out what is causing my hub lockups, I have noticed that I am getting an error from one of my echos. Can someone figure out what is wrong from this error? This error doesn't show on my other Echos. I get this error on occasion, on all echos, I think. I'm getting this error. I'm also loosing the cookie and having to manually reauthenticate with amazon??? Hello. My echo speaks works perfectly. But I noticed the log is super busy. Is this normal ? In groovy, you use the C/C++ comment symbols. I've tried a few experiments without success and I'm not sure what to try next. How do I use the Sequence in Hubitat, besides in the Sequence Creator Test? Do I have to create a custom command or is there a way to use it in Rule Machine actions, etc, directly? Do you have to manually refresh the cookie so often, or is this automatic? 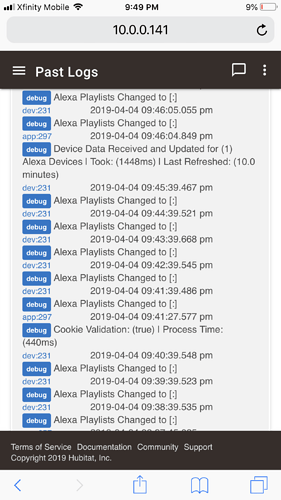 The beauty of Echo Speaks is the Heroku server that grabs the cookie periodically for you. So, automatic. Have you looked into the possibility of using "Echo Connect" to make phone calls? So that if there is like an intrusion detected, or Smoke, water ect. it will use "Echo Connect" to call you? As far as I can tell I managed to get everything setup correctly. I can send text in the device and get audio out of an echo device. 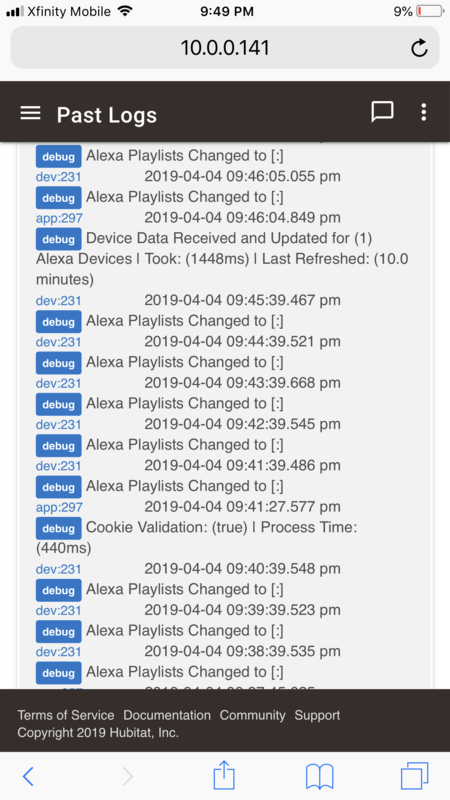 When I try to use the test page in the app, I don't get anything out of any of my echo devices. I'm just not sure what to check next. Any ideas? Am I missing something ? I'm only seeing smartthings installation instructions. I don't know if they ever created Hubitat-specific instructions. It's not to hard to follow along assuming you're familiar with both systems. Ok so should I follow the manual install method? Yes, manually install all of the App/Driver code in Huibitat as Hubitat does not have native GitHub integration. Ok got it setup thanks.